With a new multimedia toolkit, Boston Medical Center (BMC) aims to make learning about patient safety in the hospital setting more concrete, relevant and accessible to as wide an audience as possible. The toolkit, OK to Proceed? What Every Healthcare Provider Should Know About Patient Safety, is anchored by an illustrated book that addresses contributing factors and downstream impacts of patient safety. But with a flexible format and accompanying videos, its creators hope it will be appropriate and useful for people with different learning styles and levels of experience, including patients. Recognizing that “we have a new generation of learners who are accustomed to succinct, media-rich materials,” Rafael Ortega, M.D., co-editor of the toolkit and Chair of Anesthesiology and Professor at BMC and Boston University School of Medicine, explains that learners can use elements of the toolkit at their own pace, tailored to their needs, from first-year medical students to teams of practicing clinicians and others interested in patient safety. Interdisciplinary collaboration was also a guiding principle for the project, which had more than 90 contributors. The toolkit consists of a 350-page paperback text with numerous illustrations and QR codes that link to animations and video case studies. Some elements are also available on a dedicated website, where the full toolkit (as a $50 paperback and, soon, as an interactive PDF) may be purchased. Each of the book’s 52 chapters is being released on the website, one per week, through 2019 in a series called "Weekly Dose." To spread learning as widely as possible, patient safety education should include multimedia materials and accommodate different learning styles. Boston Medical Center has released a patient safety toolkit called OK to Proceed? What Every Healthcare Provider Should Know About Patient Safety, which includes hardcopy text and illustrations, audio case reports and animated videos. OK to Proceed? represents a milestone in Boston Medical Center’s ongoing response to the death of a young patient in 2003, caused by a medication error. BMC’s Anesthesiology Department, which produced the toolkit, has 20 years of experience in digital multimedia and a commitment to patient safety founded on the specialty’s role in the early days of efforts to improve safety. Ok to Proceed? was named the best instructional exhibit at the 2017 Post-Graduate Assembly in Anesthesiology. QR or “quick response” codes are optical labels that can be read with a smartphone app and link to a webpage or other online asset. QR codes in OK to Proceed? link to audio case reports and animated videos. OK to Proceed? is a milestone in BMC’s ongoing response to a medication error that took the life of an 8-year-old boy in 2003. The story of that event is the project’s first case study. Boston University School of Medicine dedicates its annual patient safety lecture and symposium to the young boy’s memory. OK to Proceed? 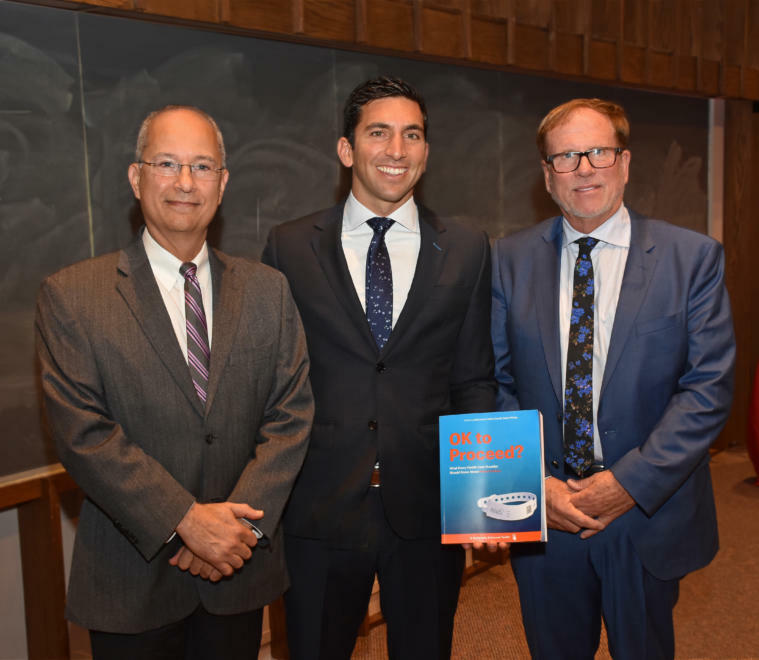 was released at the 2018 symposium in October with a presentation by Dr. Ortega and his co-editors, Keith Lewis, M.D., P.Ph., and Robert Canelli, M.D. Rafael Ortega, M.D. ; Robert Canelli, M.D. ; and Keith Lewis, M.D., P.Ph. presented the multimedia toolkit, OK to Proceed?, in October 2018 at the 14th Annual Patient Safety Symposium at Boston Medical Center. The hospital’s anesthesiology department has extensive experience in digital multimedia production and helped facilitate development of the toolkit. The department’s Media Lab partnered with the graphics department in the Boston University College of Fine Arts for the project. Dr. Ortega, who is also a musician, has a long-time interest in photography, video and sound recording. With his involvement, the anesthesiology department began using digital technologies 20 years ago. In addition to providing computer-assisted learning and video technology for the department, the Media Lab has worked with the World Health Organization on videos produced in six languages and created patient education videos with the American Society of Anesthesiologists, among other projects. Ortega and his colleagues are frequent contributors to The New England Journal of Medicine’s “Videos in Clinical Medicine” series. The Anesthesiology Department’s experience with multimedia production is not the only reason why it took the lead in developing OK to Proceed? The department is also driven by the specialty having spearheaded efforts to improve patient safety in the 1980s, following vigorous press coverage of serious patient harm caused by anesthesia errors. The national Anesthesia Patient Safety Foundation was founded in 1985 by leaders of the specialty in Boston, working with Harvard Medical School and CRICO, Harvard’s malpractice insurer. While OK to Proceed? has strong roots in anesthesiology, its editors and BMC hope it will be used widely by peer institutions and others to inspire outreach, collaboration and improvement across all specialties and interests in patient safety.